Bardney Lincolnshire’s Nathan Decastro has issued a chilling warning to his Ghanaian opponent, ‘Hitman’ Daniel Adjei Sowah, ahead of their upcoming World Title showdown at the University of Lincoln on Saturday 27th April, when the two protagonists face off for the World Boxing Union (WBU) Super Middleweight Championship of the World. Decastro’s warning following posts on Social Media quoting a Ghanaian Newspaper article where Sowah states “I’m going to knock Decastro out in 4’ which clearly hit a nerve with the man whose ring name is ‘Nightmare’, whose response was. “Knock me out in 4! Sowah’s dreaming, after we fight he’ll be having nightmares. “I’ve never lost full stop, let alone been stopped! 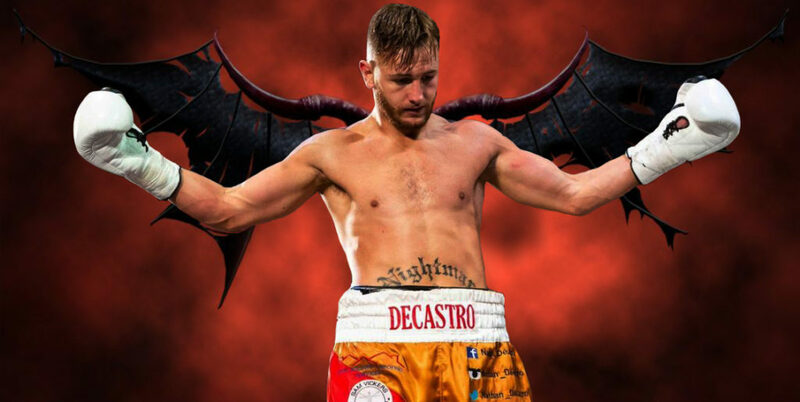 Decastro, who is Ranked #4, by the International Boxing Federation (IBF) in their Intercontinental Ratings, then wryly smiled and shrugged before swiftly changing the topic of conversation. “I’m so looking forward to the 27th, it’s been my dream to fight for a World title, specifically the WBU World title, not just because of my boxing heroes Ricky Hatton and my Promotor Lee McAllister had both won WBU World Titles, but also because Bracebridge Boxing Club, where I train, has a history with the title. Decastro continued. “My first fight was 22nd May 2001 and from that day I knew I wanted to be a professional fighter and have the opportunity to be a Champion. 18 years later I’m getting the chance to make my dream a reality and challenge for a World title in my home City of Lincoln. “I’d like to say a huge thank you to my fans, who are really getting behind me. This show will be a sell out. It really means a lot to me to have that kind of support. “I would like to say thank you to my team, my sponsors, who make this all possible, my Dad for all his time training me, pad work etc. Sam Vickers my Strength and Conditioning coach, Craig Barton my Dietician, my Physio Dale Hibberd, my Promotor Lee McAllister, thank you for putting such a storming fight card together as well as giving me the chance to fight in my home City and lastly my Girlfriend Rachel Casey. Nathan ‘Nightmare’ Decastro Versus ‘The Hitman’ Daniel Adjei Sowah for the World Boxing Union (WBU) Super Middleweight Championship of the World headlines the Lee McAllister Assassin Management and Promotions “Nightmare Back in Lincoln” event at The Engine Shed at the University of Lincoln, Brayford Pool, Lincoln LN6 7TS.